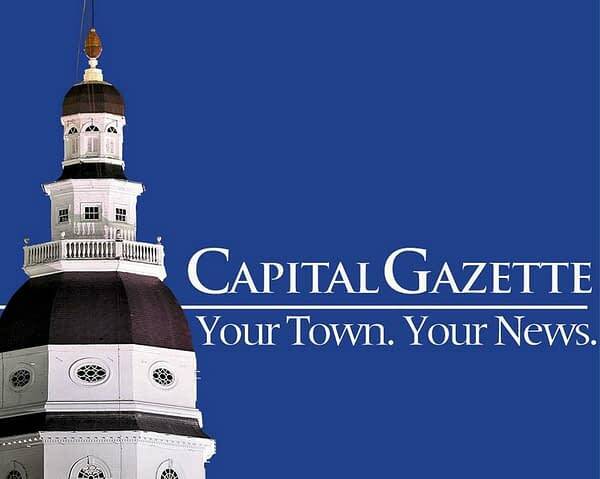 The journalism and publication world watched in outrage and horror as a gunman opened fire on the Capital Gazette building yesterday in Annapolis, Maryland. Mere hours after the chaos had begun to settle, journalists were hard at work on publishing the paper for the next day. Reporter Pat Furgurson stood behind the police officer briefing reporters on America’s latest mass shooting. A photojournalist who was out of the office rushed back to the scene. A writer detailed the terror he felt as he listened to the gunman reloading. At present, five people have been killed, with the gunman being charged with five counts of first-degree murder. We’re still learning details as to what the gunman’s goal was, but the most recent update is that he was specifically targeting The Gazette following a defamation suit he had brought against the outlet in 2015. In 2012, the gunman sued the paper for defamation. Two months following that, he filed another suit, this time well after the statute of limitations for the alleged defamation had expired, adding an allegation of invasion of privacy. Both cases were thrown out by a judge. Yes, I’m refusing to say his name. This is one of those times it really serves no purpose other than to give the gunman what he wants — recognition for his crimes. The real takeaway here is that the employees of the Gazette are resilient and deserve all the accolades for continuing to do their jobs after such a terrifying ordeal.